Huangyaguan Great Wall, located in the southern mountainous area of Jixian County in Tianjin, was originally constructed in the North Qi Dynasty, over 1,400 years ago. 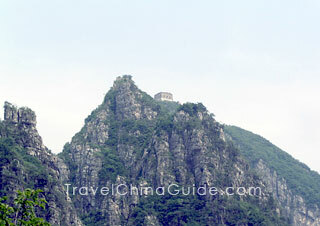 It was renovated in the Ming Dynasty (1368-1644) under the charge of General Qi Jiguang. This section of the Great Wall is about 42 kilometers (26 miles) long, and is constructed along a mountain ridge at an altitude of 736 meters (2,415 feet). It has 66 watchtowers, 52 of which were guard towers, and the remaining 14, beacon towers. Huangyaguan is a national AAAA scenic area, famous for its grand, precipitous, wonderful and graceful scenery. It is considered one of the top ten scenic spots in Tianjin. Transportation from Beijing to Huangyaguan tourist area is very convenient. There are shuttle buses from the Beijing Sihui Bus Station to Jixian County, running daily every fifteen minutes from 06:00 to 19:30. A ticket costs CNY 30 - 40 per person and the trip takes about 3 hours. You can disembark at Nanlou (South Tower) Station near the hillside road, and then take a local minibus to the tourist area. The minibus charge is about CNY20-30 and the ride takes 40 minutes, dropping you off at the entrance to the tourist area. The area includes three major scenic spots: the Strategic Fortification Area composed of the Pass Tower, the City Wall and Eight Diagrams Street; the Great Wall; the cultural tourism area including a Great Wall Museum, Longevity Garden and the Forest of Stone Steles. The entrance fee for the scenic area is CNY 45 from November to February, and CNY 50 from March to October. The ticket hall is beside the parking lot. Before entering the tourist area, you will see an archway inscribed with "Ji Bei Xiong Guan" on the front, and "Jin Tang Gong Gu" on the other side. These sets of words indicate the impregnability and indestructibility of Huangyaguan Pass, which is the only fortification in Jixian County. Behind the archway is the Gate Tower with the inscription of the Chinese characters for "Huang Ya Kou Guan". Walking through the gate, you enter the Strategic Fortification Area. The first sight you can visit is Eight Diagrams Street, also called Eight Diagrams Maze. At the center of the maze is the Great Wall Museum. If you are not sure whether you can find your way out of the maze, ask one of the staff for help. After leaving the maze, you can visit the Longevity Garden. Here, the word "longevity" is engraved in Chinese in thousands of styles. After touring the Longevity Garden, you can go to the Stone Steles Forest. In the forest, there is a 1.226-meter tall stele with an inscription reading "Stone Steles of President Mao's Poems" by President Jiang Zemin. There are 28 of Mao's poems which, altogether, have 1,893 characters. The numbers 1.226 and 1,893 represent the birth date of President Mao, December 26, 1893. Walking out of the stele forest you will reach Huangyaguan Pass, also called Bei Ji Ge (Polar Pavilion) or Xuanwu Temple. 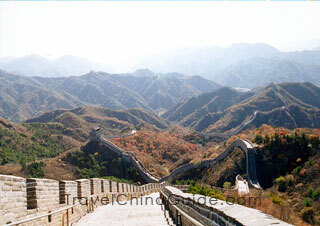 The Huangyaguan Great Wall is divided into two sections by the tower at the pass. The east section runs from the pass to Taipingzhai Wall, and the west section runs from the pass to Wangmaoding Peak. It takes four to five hours to hike both sections. Hikers are advised to climb the west section first, and then the east section, finishing at Taipingzhai wall. The west section is not very long, and a small segment of the wall is in ruins. Constructed on steep cliffs, the wall was built with stones and huge blue bricks. Most of this part is well preserved and in good condition. Climbing along this section, you will find a single-sided wall segment, with a parapet only on one side. This part of the wall was built along the ridge of the mountain and connects two cliffs at either end. A handrail has been installed along the way for safety purposes. Soon you will pass a sightseeing platform called Fairy Peak. 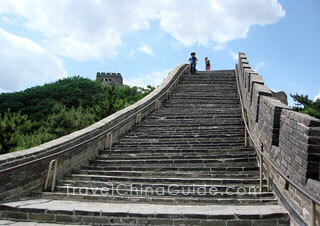 Continue to climb and you will see a steep pathway about thirty meters (33 yards) long with 300 steps. At the end of the pathway is Wangmaoding Peak. The west section ends here. Retrace your steps, and return to the pass tower. The east section extends to Taipingzhai Great Wall. This section is 873 meters (954 yards) long with altitude ranging from 400 to 500 meters (1,312 - 1,640 feet). 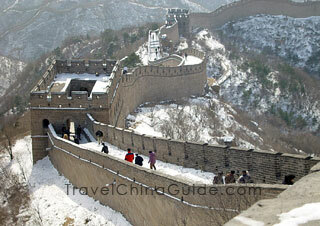 As you pass the third building along the wall, you will get a panoramic view of a watchtower, the Phoenix Watchtower. It is a round building with a square pavilion on top. Turn right and continue your hiking. After passing two or three more buildings, you will see another single-sided section of the wall. Here you will find a watchtower protruding out of the wall, the mysterious Widow Watchtower. It is said that this tower was constructed with the help of twelve wives whose husbands had died defending the wall. The tower has two stories and is about 13 meters (43 feet) tall. Four huge pillars divide the building into four halls, each with an arched roof. The building can accommodate more than ten people. 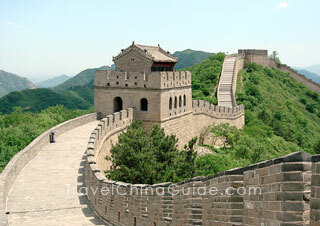 Although Taipingzhai wall is also single-sided, it is better preserved and not as dangerous as the west section. Here, too, a handrail is available as you continue along the wall. Keep hiking along the wall, and you will also come across a round enemy watchtower. From here you overlook Taipingzhai Village at the foot of the mountain (You can also start to climb Taipingzhai wall from Taipingzhai Village). Here you will find a huge stone sign inscribed with the name "Tai Ping Zhai". Your exciting exploration ends here. You can take the shuttle bus from Taipingzhai Village to the Jianxian County bus station. From there you can board shuttle buses back to the Beijing Sihui bus station. How far can I walk along this section of the wall? I have a day, so would come back the same way. You can finish this section of Great Wall in one day. Just get up and get there early.